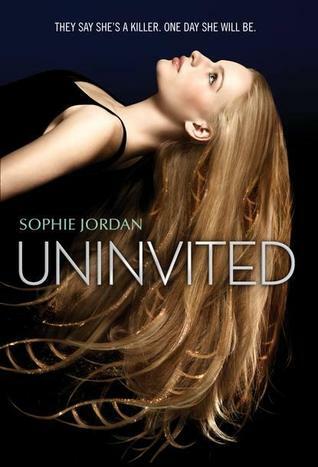 Uninvited is a rather interesting book and while I thought it was indeed fascinating and even thought provoking, I can’t say I actually liked what was happening in this particular story. See, when a story can provoke strong emotions –positive or negative- it’s a good book in my opinion. It means I care enough about what going on, but there’s a big different between disliking a certain scene or quality and actually hating everything that’s happening to our main protagonist. I’m gonna go with the whole “this isn't fair” route for this one, cause to be honest, it really isn't. I like to think that human beings have a conscience and freewill and no one can really predict your future, so to have a government come in and say that this or that person will be a criminal one day according to medical fact and then proceed without judge or jury seems rather extreme, harsh and inhuman. This is also a very dark, merciless and violent world and doesn't leave much room for anything other then fear, humiliation and pain. I wasn't exactly expecting fluff and stuff here, but some kind of humanity would have been nice. My heart really goes out to someone like Davy. She’s a kind character who obviously doesn't have a mean bone in her body but when you’re shoved in a corner with no way out what real choices do you have? Things really never got better for her, from a cage to a training camp, it seemed no matter where she went it was always dangerous. Things got from bad to worse and all I kept thinking was; this is such a cold and brutal reality to be facing and I really never understood the whys. I get the general idea here. The government has found some way to test people who may or may not have HTS- Homicidal Tendency Syndrome. And if you’re a carrier-innocent or guilty- one day you will be capable of murder. It’s like stopping crime before it even begins. Taking a criminal and giving it a label, back it up with tangible medical proof, find it, contain it and lock it away. Everyone starts to feel like they have control again and will eventually be able to go back to pretending that life is prefect in a messed up world. It’s a pretty cool and frightening concept if you think about it, but when you have someone like Davy, seeing what’s been done to her and what she’s been put through, it makes you question who the real monster are. I really liked Davy’s character. I thought her reaction to everything was really believable. She was strong at first, determined to beat down the labels and prove them wrong. We get a glimpse into the kind of life Davy lived in before and it was a good life, so when she was sent into the ‘cage’ I could really feel the magnitude of this new life. The pure intimidation and fear from the other carriers felt like a knife to your throat, twisting my stomach with hatred. When society calls you a monster and makes you live a monstrous life- even if you know who you are- doubt, resentment, fear and eventually anger will start to weigh you down to the point where you become the very thing you swore you weren't to begin with. And yet through it all, Davy fights to keep her soul intact. ~Sean is also a very interesting character. He’s mysterious, intense and although he tries to push Davy away he turns out to be the only positive force in her world. I love the way he always seemed to be protecting her- be dame the consequence. Although, there is something about him that makes me questions his true role in this story-line, it could be my active imagination wandering, but I think he may not actually be who we think he is. I guess only time will tell. I also really liked Davy’s family, specially her brother Mitchell. It broke my heart to see them in such emotional heartache and being powerless to do anything to stop this from happening to Davy. It was so good to see that someone still believed in her and their unconditional love and support felt like a giant hug in a very unforgiving world. The romance is very light, at first it was more of a general fondness for one another and a certain understanding given their cruel situation, but later it became something promising and a desperation to believe that love is possible in all this ugliness. I also liked the ending, it gave us a sliver of hope that I think readers need to hold on to when they read this book since it felt like the entire story at this point doesn't have any real direction or reason as to why this even happened to someone like Davy and even other characters who don't seem to fit the criminal vibe. For the most part it may seem like I didn't enjoy this book, but I really did. It may not be a favorite and it may stir-up some rather hateful feelings for this particular world, but it’s a concept that is very much intriguing and compelling. Jordan has delivered a plausible universe that is scary as hell to contemplate with likable and realistic characters that you can’t help be invested in from minute one. I’m also curious enough to want to know what happens next and look forward to seeing what Jordan has planned for these characters and this world. Wonderful review, I will be reading it closer to release date, and I am anxious to discover this dark world. Thank you :-) I hope you enjoy this. This was such an awesome review! It makes me want to go out and read the book right now. It sounds like it makes you question a lot of things in the world and that's always a good thing!